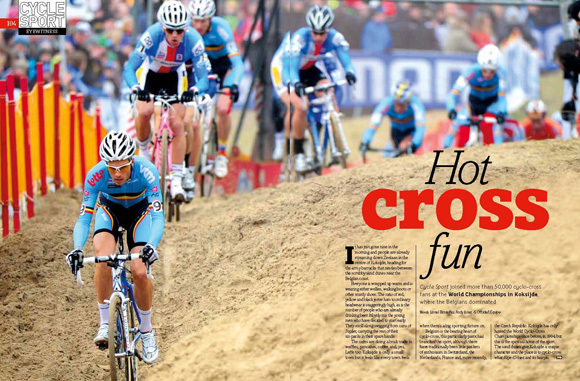 Cycle Sport April: out now! 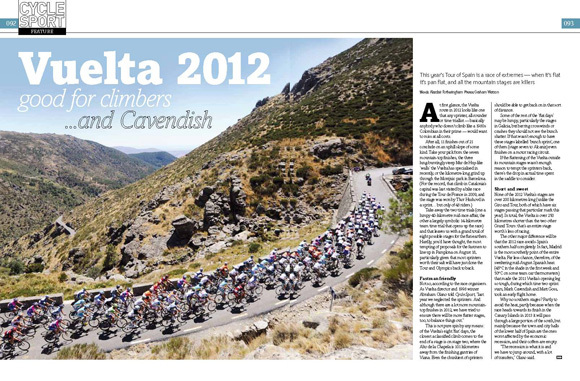 Cycle Sport April is out in UK shops now, featuring the very best writing and photography of professional cycling. 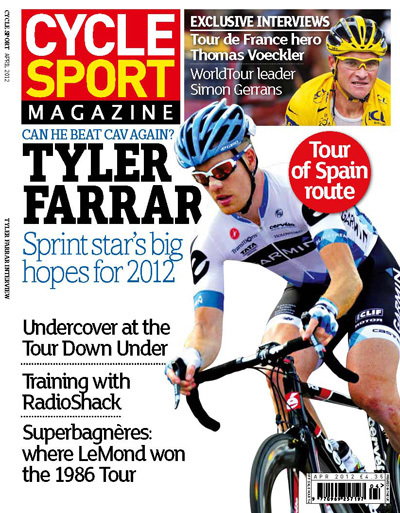 This month’s edition contains interviews with Thomas Voeckler, Tyler Farrar and Tour Down Under winner Simon Gerrans, as well as our brand new column from inside the peloton, written by an anonymous professional cyclist. 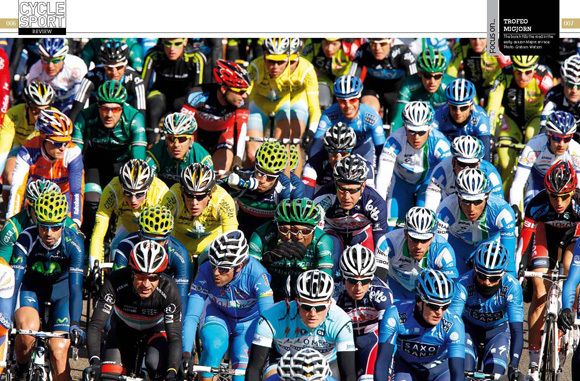 Priced £4.35, Cycle Sport is the best international cycling magazine in the world. Thomas Voeckler lit up last year’s Tour de France, winning the yellow jersey in the Massif Central, then, incredibly, holding onto it through the Pyrenees and Alps, all the way to Alpe d’Huez. For a few, unbelievable days, it looked like he could even win the race. While he wore the yellow jersey in 2004, under similar circumstances, he only ever looked like he was borrowing the race lead. In 2011, he visibly grew in confidence every day he defended his lead. It was only on that last summit finish that his grip on yellow was finally broken. 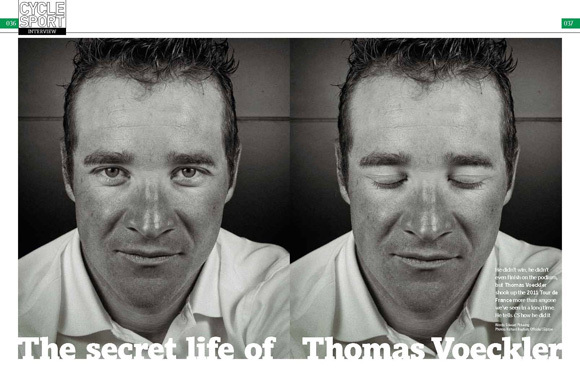 Voeckler talked openly and frankly with Cycle Sport about the importance of protecting himself from his own celebrity, and also explained the unforgettable Tour he had last year. He confirms that he never thought he could win the race, but acknowledges that a terrible tactical error on the Alpe d’Huez stage probably cost him second place overall. “I’ve found it difficult to come to terms with that,” he admits. 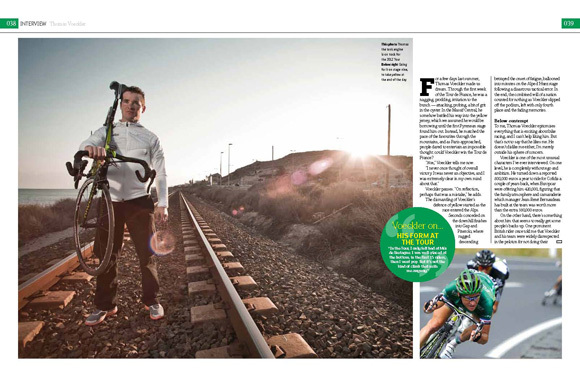 With superb portraits by Richard Baybutt, Cycle Sport shows a new side to Thomas Voeckler. 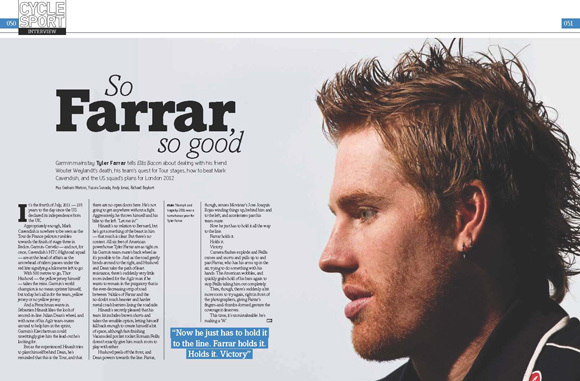 2011 was a year of terrible contrasts for Garmin’s sprinter Tyler Farrar. He endured the personal tragedy of losing one of his best friends, Wouter Weylandt, who died in a crash at the Giro d’Italia. But the American drew strength from somewhere to take his greatest triumph, an Independence Day stage win at the Tour de France. That sprint stage win was one of the most tactically impressive of the entire race – Garmin planned an ambush on Mark Cavendish’s HTC leadout, and executed it to perfection, the day after having achieved a similar feat in the team time trial the day before. We sent blogger Felix Lowe (you might know him better as the congenitally irreverent Blazin’ Saddles, on the Eurosport site) to the Tour Down Under, with strict instructions to let nothing, not even self-respect nor regular behavioural norms, get in the way of experiencing the colourful underbelly of the first WorldTour race of the season. He didn’t let us down, sending us his Tour Down Under Diary. Felix spent a day in both Astana and Katusha team cars, living to tell the tale, interviewed Paul Sherwen about André Greipel’s thighs (“f***ing enormous”) and crashed the post-race party, using Borut Bozic’s wristband pass. 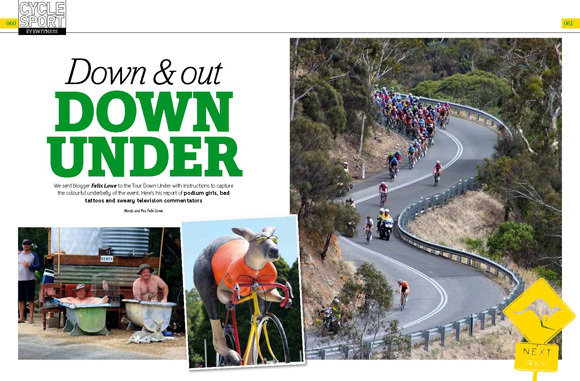 You won’t get the real story of the Tour Down Under from any other source. 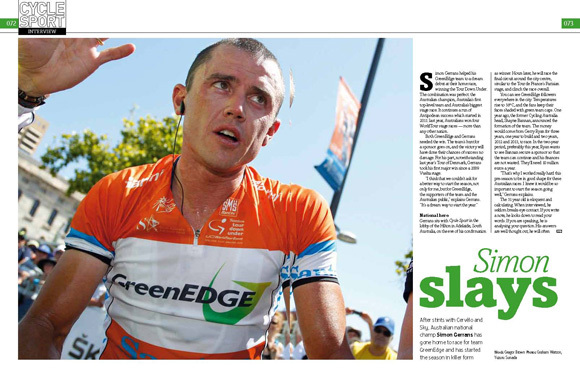 While our man on the ground was abusing the hospitality of the TDU, let’s not forget that there was actually a bike race on as well, and the winner was homeboy Simon Gerrans, the national champion, who rides for fledgling Australian team GreenEdge. 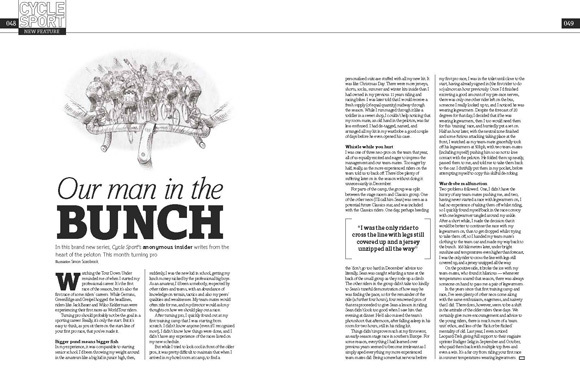 Gregor Brown caught up with Gerrans on the eve of his victory, and found a direct, analytical and thoughtful interviewee. Results were thin on the ground for the Australian at Sky, but he believes he has turned a corner with GreenEdge, and will go to the Ardennes Classics and Amstel Gold with the belief that he can win one of them, following his third place at Amstel last year. He’s also relishing the challenge of being a team leader, after realising that at Sky, his ambitions would always come behind those of Mark Cavendish and Bradley Wiggins. The merger of the RadioShack and Leopard-Trek teams over the winter was one of the most intriguing sagas of the off-season. While they seemed to take the best of both teams, including the Schleck brothers, Fabian Cancellara, Jens Voigt and Chris Horner, the recent experience of Katusha, Sky and Leopard suggests that results are hard to come by for new teams. We followed RadioShack-Nissan at their team training camp in Majorca to see first hand how the team was working together to overcome those challenges. 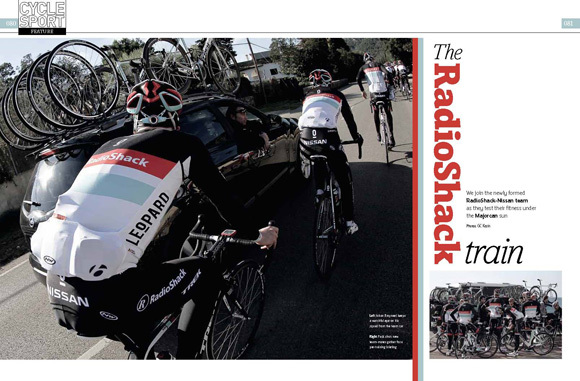 Our photo essay shows how the RadioShack team took its first steps to possibly challenging for the Tour de France. Jason McCartney carved out a very good career as one of the most respected domestiques to come out of the United States. He worked his way up by the hard route, racing domestically before a good performance in the 2004 Tour of Georgia won him a place on the Discovery Channel team. He then rode for Saxo Bank and RadioShack. 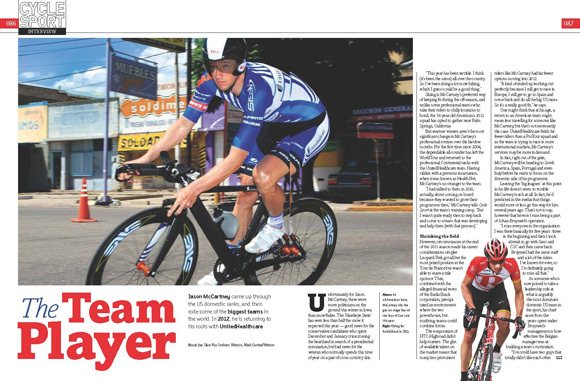 For 2012, he’s returning to his roots, with a transfer to the UnitedHealthcare team. He explains to Joe Silva that while he’s no longer on the WorldTour, he will still be competing in some of the biggest races in the world, with the freedom to try and get results for himself, and share his huge experience with his team-mates. Are we about to see a golden generation of Dutch climbers? Rabobank’s Robert Gesink and Bauke Mollema have already impressed in the Grand Tours, as has Steven Kruijswijk who emerged to take ninth in the Giro last year, and bag a Tour of Switzerland stage. Alasdair Fotheringham interviewed the young Dutchman, who relishes the challenge of the Grand Tours and is looking forward to a Tour de France debut in 2012. Iconic Places visits one of our favourite climbs of all time, Superbagnères in the Pyrenees. It was on this climb that Greg LeMond took the yellow jersey in 1986, the first year he won the Tour. He lost the jersey to Laurent Fignon on the same climb in 1989, the year Robert Millar won the stage. Chris Sidwells looks at the history of the Tour de France on this tough climb, and regrets that in spite of non-stop drama every time the race has visited, the race has not been back since that epic day in 1989. Buy Cycle Sport this month, answer a simple question and you could be the proud winner of a signed BMC jersey – competition on page 24 of the magazine. 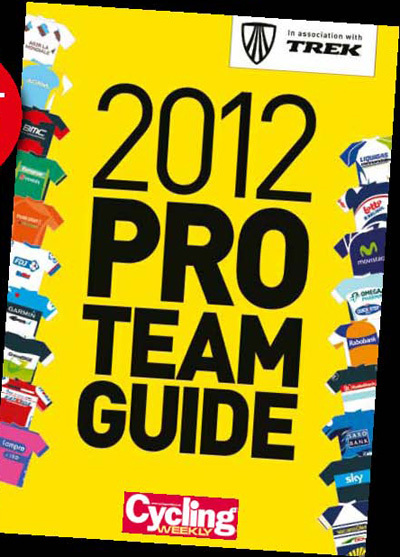 If that wasn’t enough, Cycle Sport comes with a free, handy pocket-sized 2012 teams guide to accompany you through the season. 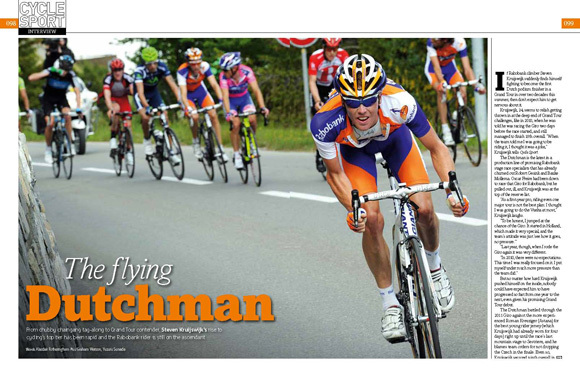 Plus…All our regular features – Graham Watson sends us a Tour Down Under dispatch; Broomwagon reacts to Contador and Armstrong, with exclusive reaction from Contador to his ban (“couldn’t they extend it a bit so I don’t have to ride the Vuelta?”); Shop Window tempts weak-willed cycling fans to raid their life savings for the latest bling bike gear; Any Questions with Bernhard Eisel (“Me and Cav argue when I leave drawers open in the room.”); Contador; Armstrong; some brand-new additions to the front end of the magazine: scurrilous rumours, Eurotrash, our new handwritten quiz and self-portrait with Garmin’s Peter Stetina; fantasy team of the month; top 10 rider superstitions; Geraint Thomas writes from the TDU; and much much more. Cycle Sport April, featuring the very best writing and photography of professional cycling, is available from Wednesday February 15 in the UK, priced only £4.35, and later in the USA. It is also available electronically through Zinio.